Wow! 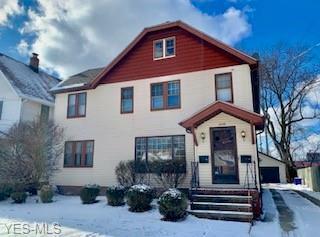 Outstanding investment opportunity- Great rental potential in this spacious Rocky River two-family. Both over-sized units offer THREE bedrooms. Many recent updates including roof/gutters (2013), Central air/new furnaces (2014), paint, hardwood floors, updated kitchens, new 2 car garage (2016), updated electrical panels (2019), landscaping, and much more. Additional parking in back. Great central location. Long term tenant downstairs.